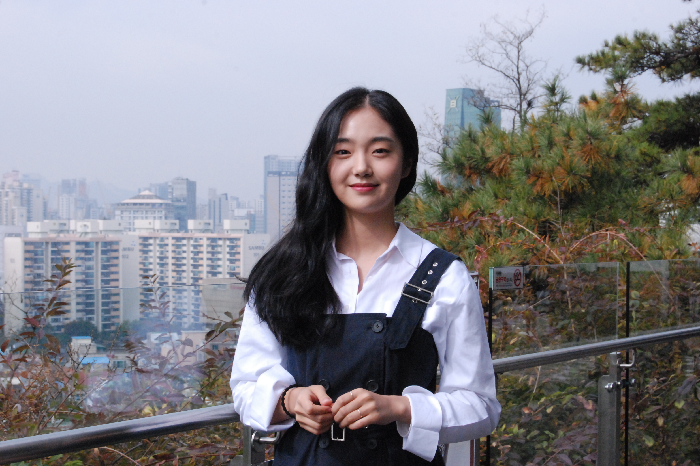 Hanyang University’s (HYU) very own rising star Kim Hye-jun, a junior majoring in the Department of Theater and Film, just recently finished shooting the SBS drama ‘Reunited Worlds’. She was noticed for her exceptional acting while she was playing the role of a happy and cheerful character who was the youngest sister of the male lead. Now she is preparing for the next drama that will air in December of 2017. We had the opportunity to meet actor Kim Hye-Jun and ask her a few questions about her acting career. Q. Can you introduce yourself? A. Hello. I'm Kim Hye-jun. I am majoring in Department of Theater and Film in HYU and am currently an actress. Q. We heard that you were casted in a new drama called ‘Just in Love’. Are you excited about being a part of a new drama? A. I definitely am. The director in charge also directed the hit drama ‘A Nice Man,' which is personally one of my favorites. I am also excited because this time I will get to play a character with a calm temper, which is a character that I have always wanted to play. Q. Why did you decide to be an actor? A. There is no special reason. It was just an idea that went through my mind and eventually latched on to my consciousness. Q. Is it not hard for you to balance your university life and your acting career? A. I do feel rather sad because it always seems like I am neglecting my academic life when I am pursuing my acting career. I want to participate in our department’s workshops and act in school plays, but I normally cannot when I am shooting another drama or film. I did find emotional ease when I decided to focus on my acting career. Q. Is there any experience from being a student in HYU that has helped you become a better actor? A. I have learned a lot about being a part of a group through my experience as being a student in the Department of Theater and Film. Students who major in Theater and Film are required to participate in workshop seminars every semester. Here, we work together to put on plays. Working alongside with my fellow colleagues and professors has taught me how to adapt quickly to new situations and communicate more effectively with others. Q. What is your strength as an actor? A. I am good at reading people and this helps me adapt to new circumstances. However, I do view this as my weakness as well, since I always become hyperactively aware of the emotions that other people have. Under these circumstances, the slightest change of expression from someone grabs my attention and provokes me to worry about their thoughts. Q. What kind of actor do you want to become? A. I haven’t really thought about what kind of actor I want to be because I believe that you need to be a good person before you become a good actor. If I were to choose, though, I do want to be an actor who leaves a strong impression on the audience.